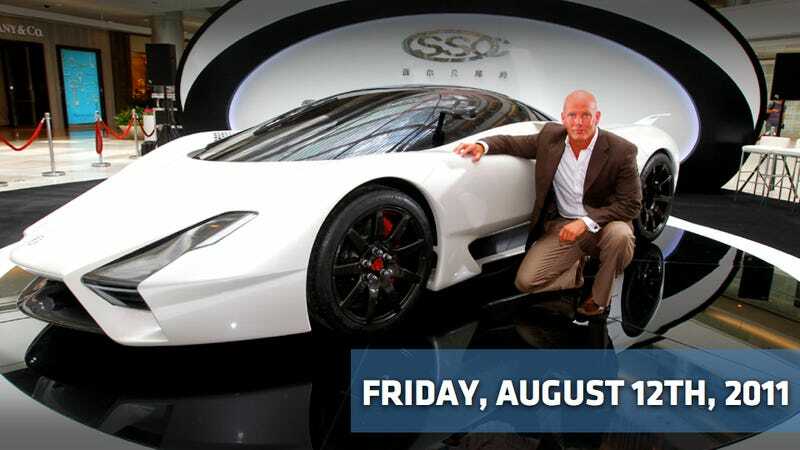 Shelby SuperCars publicly dropped the cloth on the unfortunately-named SSC Tuatara for the press for the first time yesterday in Shanghai. In attendance was Jason Castriota, the designer behind not only this new SSC, but also the Stile Bertone Mantide, the P4/5 Pininfarina, Maserati Birdcage, the Saab PhoeniX, and defender of design decency, attended the event and answered media questions alongside Jerod Shelby, SSC Asia President Don Xu, and SSC Asia Co‐Founder Jason He as they unveiled the Tuatara at what looks like a mall. Seriously, is that a Tiffany's behind the stage? Mercedes-Benz boss Dieter Zetsche has given approval for a second Shooting Brake model to accompany the brand's eagerly awaited CLS Shooting Brake due out in 2012, according to German media reports repeated this morning by Automotive News. The new model is expected to go on sale in North America in 2014. It's based on the German carmaker's upcoming CLC—a four-door coupe that uses a new platform that will offer buyers a stylish but practical rival to the likes of the Audi A5 Sportback and the upcoming BMW 3-series GT. The CLC variant would be priced below the larger and more opulent CLS version. The five-door CLC Shooting Brake is set to receive a sloping roof and a heavily angled tailgate that eschews outright load capacity for head-turning style. It will be sold alongside the CLC coupe, which Mercedes has confirmed will go on sale in the U.S. market in 2013. Bloomberg reports this morning that Tata Motors, the owner of Jaguar Land Rover, reported first-quarter profits that ended up shaking out lower than analysts' estimates as sales of its passenger cars in India fell and Jaguar deliveries declined. Net income rose to 20 billion rupees ($441 million) in the three months ended June 30, from 19.9 billion rupees a year earlier, according to a statement from the automaker today. This was lower than the median of 21.6 billion rupees of 32 analysts' estimates compiled by Bloomberg. I'm just excited I got to use the words "Tata" and "shaking" in the same sentence this morning. What can I say — it's a slow news day. 5th Gear: Don't Trust The Midas Touch Won't Be Sold The Associated Press reports this morning that auto repair company Midas said Thursday it is exploring a possible sale, merger or other business combination that would enhance value for its stockholders. Shares surged $2.42, or 37%, to $9 in after-hours trading after the announcement of the decision. Ford is playing the global product development team shuffle: Barb Samardzich is moving from the US to head up Ford of Europe's product development, reporting in to Stephen Odell, CEO of the Dearborn, MI-based automaker's European arm. This'll all start September 1st. You can keep up with Ray Wert, the author of this post, on Google+, Twitter or Facebook.